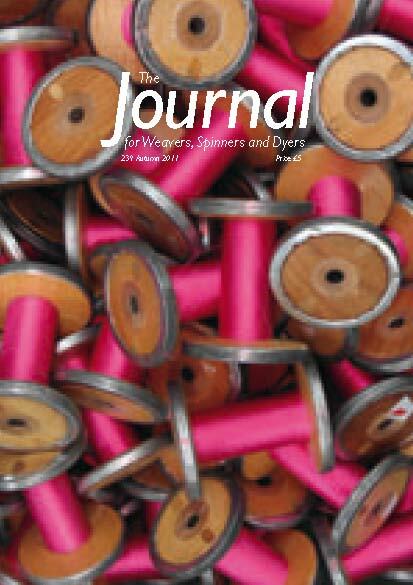 Editions of the Journal are available to buy individually, subject to supply. Orders can be delivered worldwide. Due to tax reasons, sadly digital products are not available for EU customers outside of the UK. Brush up your knowledge with Jill Riley's back-to-basics Weaving Glossary, clearly explaining the commonly used but sometimes confusing terminology of looms and other equipment. Belinda Rose describes the operation of computer-controlled Jacquard looms, with their myriad of exciting design possibilities. Try eco-friendly dyeing methods by following Aprina Murwanti's interesting marbling techniques, using vegetable waste from the kitchen. Amanda Hannaford describes how she prepared Cornish camel fibre to produce a subtle natural colour gradient of combed sliver and rolags, ready for spinning. Our mini-series exploring different approaches to working with colour continues as Theo Wright describes how his designs explore control of colour values, while Isabella Whitworth helps her pupils develop their colour confidence. Christina Chisholm, very often inspired by the natural landscape, describes developing colour design from photograph to woven/knitted sample. 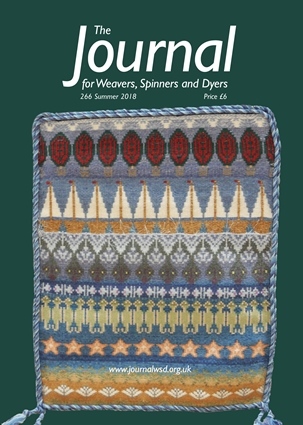 Jessie McCaffrey describes her creation of a traditional Shetland Taatit marriage rug for a wedding gift, we highlight Guild activities around the country and provide reviews of exhibitions and new books to inspire your creative projects. Reader's Showcase : The Story of my Taatit Marriage Rug, Jessie McCaffery, page 28 . Our Autumn 2018 issue focused on the fascinating subject of colour; we had so much lovely copy to try to squeeze in that it spilled on into this next issue! So we continue to explore colour with a feast of ideas, starting with Sarah Pape's explanation of how the theory of colour perception explained in her earlier article can be applied to planning our textile projects. Amanda Hannaford explains how space dyed tops can be spun and plied in many inventive ways, whilst Leonor Calaca works from an individually designed and carded 'art' batt; both create lively and interesting core-spun yarns with their different approaches. Dyers will be impressed by Patricia Dyson's striking but practical Handspun Swagger Coat, using a unique mix of handspun and hand-dyed skeins. Jill Riley interviews tapestry weaver Naomi Robertson of the Dovecot Studio, and Rosalind Lobb researches the construction of a striking Baluchistan tent hanging. Dyeing knitted blanks to create very individual and colourful projects is easily achievable following step-by-step practical advice from Debbie Tomkies. In this issue we start a mini-series exploring different, often personal, approaches to colour in the context of textile design, with contributions from talented multi-disciplined practitioners. Bright colours shone in the hot sun at London Guild's Natural Dye Demonstration at Southwark Cathedral this summer, whilst at the other end of the UK visitors were enjoying the beautifully-presented National Exhibition in Glasgow. Turn to Guild Highlights and Exhibition Reports for details. And to drop 'gift hints', don't forget our book reviews! Reader's Showcase : Fifty Shades of Stash - A Handspun Swagger Coat,, Patricia Dyson, page 32 . Our special colour themed issue looks at many aspects of this fascinating, and often challenging, subject.  To start, and before our visual senses are confused by a kaleidoscope of possibilities, Sarah Pape explains in very straightforward terminology the theory of colour perception. We move on to the primaries: a whistle-stop tour of blue, looking at indigo under the expert guidance of Jenny Balfour Paul, Association President; fascinating research into Norwich Red with Susan Dye and Hannah Sabberton; and finally we explore the warm yellows of the Moroccan sun with Aviva Leigh. Practical advice follows; Rachael Prest experiments with spinning hand-dyed tops to produce varied striped, woven fabrics, whilst Michael Crompton describes his distinctive method of using colour in tapestry weaving. More advanced weavers will enjoy following Rosalie's Neilson's step-by-step guide to weaving a colourful rep runner on 4 or 8 shafts. We've also tried our best to focus on colour in our regulars – Notebook, Book and Exhibition Reviews and Guild Highlights – for our most colourful issue ever. Colours of the Sun, Aviva Leigh, page 26 . 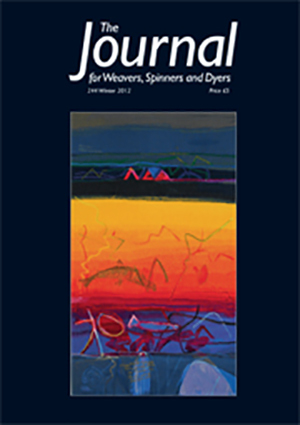 This issue of your Journal ventures far and wide! Explore traditional weaving on the Pacific Outer Islands of Yap as the indigenous craftswomen maintain their cultural identity, whilst, firmly within our shores, a Bradford-based group of enthusiasts attempt to recreate historical dye recipes at a restored local mill. Follow the inspiring story of a new weaver, who mounted her own private exhibition of textiles woven on homemade looms just a year after starting to weave. Then travel overseas again, this time to the Ryukyu Islands of Japan to learn the intricacies of the meticulous art of ikat, a resist dyeing technique practised in many countries. For spinners, we provide tips for maintaining your spinning equipment - and pose an interesting question : Are dog combs suitable for fibre preparation? 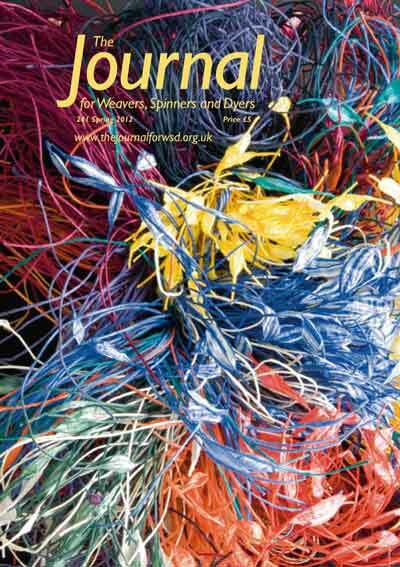 Our regular features include Guild Highlights, Reader's Showcase (featuring the collaborative boundweave project on our front cover), Exhibition Reviews (from London to India) and Book Reviews. Dog Combs - A Useful Fibre Preparation Tool?, Ann Fisher, page 24 . Don Porritt, loom-builder, supplier and silversmith is profiled by Pete Leonard and Paddy Bakker, Life President of the Association, is interviewed by Janet Maher on the occasion of her recent retrospective exhibition, Cloth and Clay. Isabella Whitworth describes her amazing chance discovery in an industrial dye manufacturer's archive - purple threads, stated as having been dyed using shellfish, a process not known to have been carried out since the 15th century. Tamara Poff provides practical advice for successfully combining yarns of different weights on a rigid heddle loom, including a simple cowl for you to weave. Christine Jordan seeks the perfect fleece for Aran knitting, whilst tapestry weavers will take inspiration from Leslie Fox's art deco design development. The Orkney islands inspire Christina Chisholm to design a silk handspun accent yarn for weaving. Janet Maher, the Foundation Certificate Co-ordinator, details the Spinning syllabus and invites you to hone your skills by signing up. Foundation Certificates: What Are They?, J.S. Maher, page 33 . We start by exploring the traditional natural dyeing practices of Scotland with Carole Keepax. Either natural or synthetic dyes could be used to follow the practical advice from Martin Weatherhead describing how to create interesting effects with warp ikat, on either an inkle or a shaft loom. During a coffee break, we can travel across the Irish sea with Susan Foulkes in her quest to discover the fascinating background to the crios, a traditional woven belt from the Aran Islands. In an informative back-to-basics article, Ann Fisher explains why fleece should always be washed before spinning. Isabella Whitworth adds an interesting twist to natural dyeing with the use of mordant pastes to create her distinctive silk scarves, and Nik Knott describes her experience trialling the Association's recently launched Foundation Certificate in Spinning. 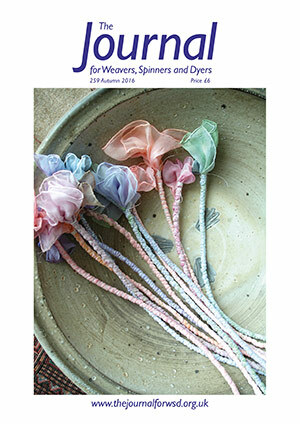 Foundation Certificate in Spinning – A Student’s Perspectivel, Nik Knott, page 32 . Amanda Hannaford takes us to Tibet, sharing her experience last year teaching spinning, natural dyeing, knitting and crochet, as part of a project to establish a textile workshop to support Tibetan nomads. And on a textile tour to Gujarat, Alison Stattersfield, Jane Stockley and Lucy Rhodes received a warm welcome from the traditional handweavers they visited, greatly admiring their considerable skill in producing fine fabrics from basic and very well-used looms. Back home, Susan Dye and Ashley Walker provide a very comprehensive guide to growing, harvesting and getting the very best reds from madder, whilst Christina Chisholm demonstrates that you don't necessarily need to use metallic salts for effective mordanting. Judith Edwards describes the fascinating history of her Bosworth Journey Wheel and Jane Deane explains how to spin a unique yarn from paper and flax. Equally unusual are some of the innovative projects supported by the Theo Moorman Trust for Weavers, as described by the latest award recipients. 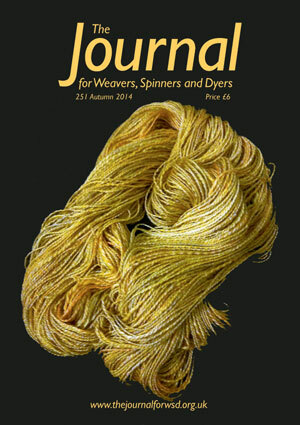 In this issue we unravel more mysteries of the much-prized dye process, Turkey Red, under the expert guidance of Julie Wertz, and learn how to produce both red and yellow natural dyes using the same safflower petals from well-known author Jenny Dean. 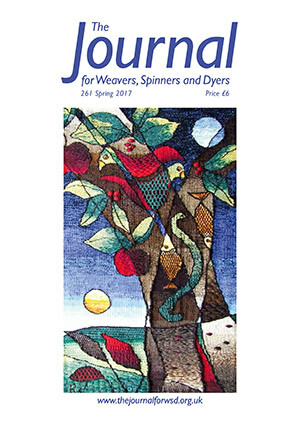 Michael Crompton describes his design process from travel inspiration to woven tapestry, while Ann Fisher brings us back to basics with her detailed Spinner's Glossary. Historians will enjoy Glenys Crocker's exploration of the capabilities of the warp weighted loom, while Beryl Cole's recently designed and registered tartan provided a unique highlight to her daughter's wedding. Our Exhibitions Reviews have an international flavour, from Edinburgh and Zetten, Netherlands, to Georgia, Vancouver and Seattle. Closer to home, Guild activities explore growing flax within the M25, coastal inspiration, alpacas, natural dyes...and then cross the continents to Kashmir. From Tabby to Twill on the Warp-Weighted Loom, Glenys Crocker, page 28 . Tapestry weavers will be inspired and entranced by Ros Wilson's work under the skilful guidance of Máximo Laura in Peru, whilst three of the graduate award winners at New Designers 2016 describe their skill development experiences during their studies, and their plans for the future. 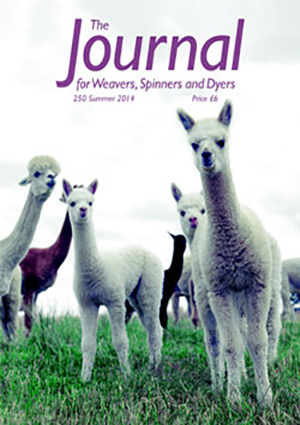 Jane Lucas gives spinners detailed advice on preparing and spinning alpaca fibre - and then combining it with other fibres in interesting and innovative blends. Our Exhibition Reviews include three reports of the much acclaimed National Exhibition, and Janet Maher, the Exhibition Convenor, provides a fascinating insight into the work involved in planning a national event. But before our feature articles you will find moving tributes, from friends and colleagues, to the late Stuart Groom, ex-Chair of the GPC. Readers’ Showcase: Firth of Tay, Cally Booker, page 30 . Variety is the spice of life - as we compile the content of your Journal, members of the Editorial Committee seek to encourage exploration beyond conventional practices and traditions. 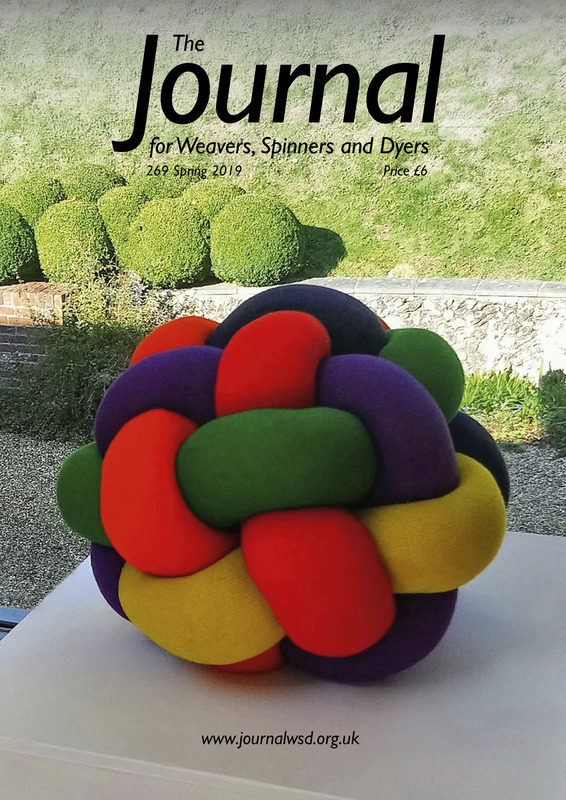 Turn to page 32 for Jennie Parry's exquisite woven paper yarn suspended sculptures and page 41 for Electronics in Textiles and Clothing, a new cutting edge book explaining how science and art can be blended. In our regular feature articles, Janet Phillips provides practical advice on Cloth Finishing, while Debbie Bamford explains the fascinating history of Turkey Red. Ideas for collaborative guild study groups will be inspired by the Cambridgeshire Guild's Peruvian Textile Study Group. Berry Cutler's achievements show that our younger guild members are taking delight in producing wearable textiles - turn to our Correspondence pages for some more ideas. 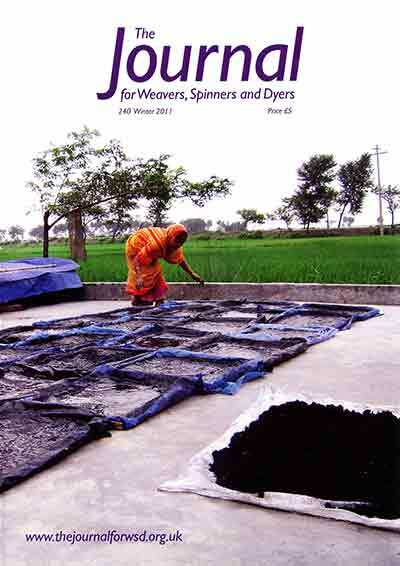 Explore the different effects at the fingertips of weavers who also spin and dye their own fibres. Or sit back to read a fascinating account of traditional textile production on the Outer Hebrides. 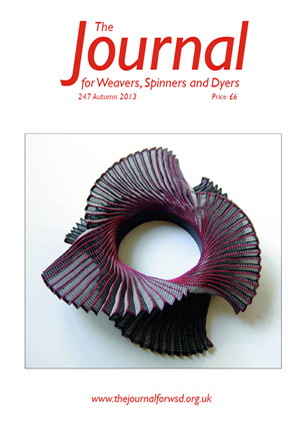 Spin and Dye – or Dye and Spin – to Weave, Christina Chisholm, page 41 . As autumn is traditionally the start of the academic year, our new issue encourages you to learn new skills. Isabella Whitworth's in-depth Dye Glossary is an ideal place to start for spinners or weavers who would like to expand their options by learning to dye their fibres or yarns for unique, eye-catching projects. 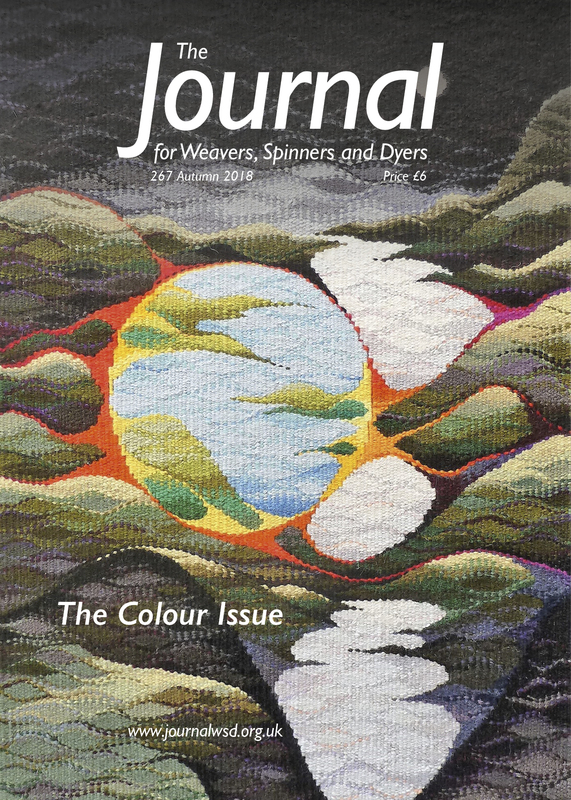 Spinners who love combining colour and texture will appreciate the boost to their creative juices from Helen Melvin's in-depth description of spinning Art Yarns. Stacey Harvey-Brown celebrates the versatility of weaving with just eight shafts with her amazing doublecloth structures. Start planning for next year with the mouthwatering list of courses on offer at the Association Summer School, to be held in Hampshire next August. Alice Kraus Stransky, Oonagh Stransky, page 25 . Theo Wright describes his mathematically based weave project, Permutations; Laura Rosenzweig shares some simple art based ideas for igniting design and colour ideas for weaving, plus the benefits of doing these in the company of like-minded friends; Christina Chisholm explains how she found inspiration in her garden for a beautiful hand spun, dyed and woven silk wrap. 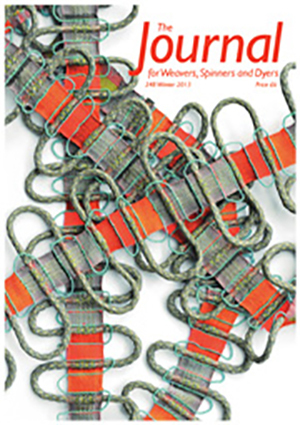 Spinners and upcyclers will find inspiration, and instruction, in Lorna Lindfield’s article The Mother of Invention, for turning waste fabrics into unique and characterful yarns. Summertime is often the season of travel, Jenny Balfour-Paul offers us some tantalising glimpses into the colourful textile culture of Myanmar. Continuing the travel theme, Catharine Ellis recounts the fascinating story of how a global team came together in the Natural Dye Project to sensitively assist a Guatemalan textile community. Ruth Winterbottom shares an inspiring personal journey, the one she undertook to discover how she could continue spinning and weaving, despite unexpected disabilities. The Theo Moorman Trust Award recipients of 2014 explain what their award has meant to them and for their work. Top Tip for Warping, Christina Chisholm, page 45 . With spring in the air, Jenny Dean shows us how to dye a stunning range of greens with natural dyes. Join two Online Guild members as they experience cotton cultivation in Barbados, then listen to Gretchen Roth describe the challenges of growing warmth-loving cotton plants in Lancashire! Would you like to learn to spin, but without a big financial outlay? Would you like your spinning to be more portable? And, even easy to do whilst sat in an armchair? If the answer is yes to any, or all, of these questions, be inspired by Sally Hands who, as a result of her own experience, writes In Praise of the Humble Spindle. Have you wondered about the potential longevity of your lovingly created works of art? Margaret Smith and Frances Leonard explain research that has been undertaken to understand the yarns and fibres used in the Stirling Tapestry Project. Read reports from the Association Summer School 2015 and the Certificate of Achievement programme. An Interview with Jenny Kilbride MBE, Riley Jill, page 7 . Feed a sense of adventure! Hear from Rex Cowan how dye stuffs are not only being recovered from shipwrecks, but can still, after many years in sea water, produce beautiful colour. Interpreting artwork in tapestry requires a range of yarns in specific colours; Philip Sanderson explains how they do this in the studio dye laboratory at West Dean College. Jenni Stuart describes her challenge to weave a throw with yarn spun from a local farmer’s sheep, and two experienced weavers write about their projects inspired by a London Guild competition. Weaving a Throw for Farmer Ben, Stewart Jenni, page 11 . Discover how dyer, Jane Spavold Tims, finds poetic inspiration through the collection and use of plant dyestuffs gathered from her Canadian surroundings. Spinners will be interested to hear Retha Durose describe her journey into spinning and the spinning wheel her husband made for her. Barbro Heikinmatti shares her fascinating study of six Nordic sheep breeds. 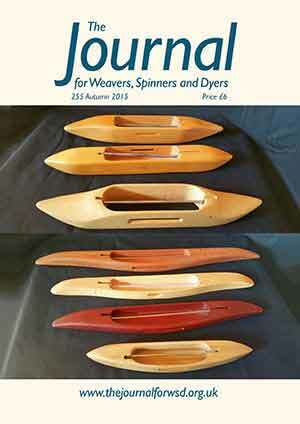 Weaver Jette Vandermeiden discusses the variety of boat shuttles; explaining when and why to use them. Suzanne Townsend describes how The Handweavers Diploma enabled her, and fellow students, to develop their weave skills and interests. Robbie LaFleur explains how she has interpreted one motif in many different textile mediums. A recent highlight of the Lancs and Lakes Guild activity, was the reproduction of the Kendal Pattern Book; Alison Ongley writes about their joys, and challenges. My Scream Series, LaFleur Robbie, page 17 . Join Lydia Hill on her quest to master the art of sheep shearing and Steve Higgins as he writes about the history and special qualities of Lincoln Longwool sheep. Find out how natural dyer Deb Bamford tackled an epic dye project; dyeing linen cloth with weld and madder for a Viking-style sail. Steven Byrd describes how traditional Peruvian weaving, spinning and dyeing skills are being kept alive and well at the Lorapo cooperative. Two very different weavers explain how they went about specific projects; time was limited for Katherine Swales as she wove a tapestry interpreting artwork for Studio Toogood, while Sue Brigg designed and sampled triple-cloth for pleated textile jewellery. Discover how a tennis ball’s cloth cover is produced using traditional skills. Designing pleated triplecloth jewellery, Brigg Sue, page 17 . Can you be sure to have enough fibre for a project, before starting it? Klara Decker explains how. Amanda Hannaford shows us step-by-step, how to produce space-dyed tops. 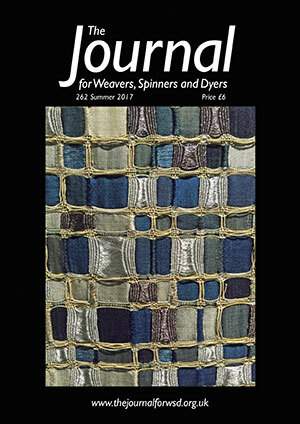 Weavers will be intrigued by Merilyn Green’s account of Weaving Damask on a Drawloom. Rita Parniczky tells us about her X-ray fabrics and Jo Atherton explains how and why she weaves art from flotsam. See how spinners got ‘out and about’ for Worldwide Spin in Public Day. Hear the fascinating story of a Shrewsbury Flax Mill and the 'Flax to Fabric' project it has inspired. 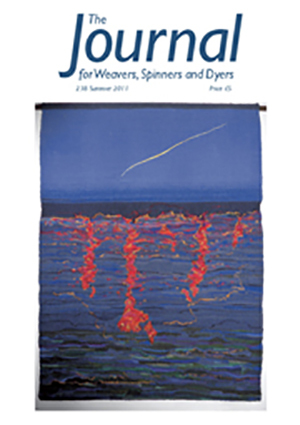 2015 sees the diamond anniversary of the Association of Guild’s for Weavers, Spinners and Dyers; Jill Riley takes us on a journey through its 60 years of challenges and changes. Lost and Found: The ebb and flow of weaving with flotsam, Atherton Jo, page 9 . 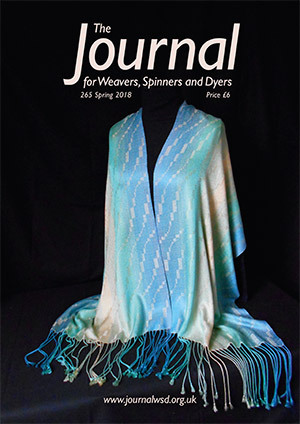 Spinners will find tips from Klara Decker on how to spin the yarn they want for their project; Ann Fisher Rhodes shares how she did exactly that, then dyed and wove her yarns into a truly handcrafted silk corset. Dyer Fiona Sanderson shares her very personal experience of sandalwood washed ashore from Orcadian shipwrecks. Are you wondering how to teach young people to dye, spin or weave - particularly in school? Jane Deane shares simple, effective and safe ideas to inspire them and their teachers. 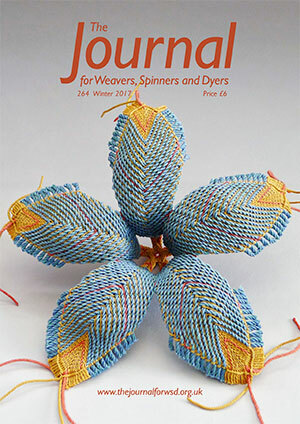 Carol James explains Canadian fingerweaving and how to get started with a simple project. Follow along with Dianne Hewitt as she tries out Maori flax weaving in New Zealand. Closer to home, Lorna Lindfield interviews Rachel Powell about her creative projects involving visitors to Ormsby Hall. Find out about some recent Guild activities plus recent exhibitions and new books that provide a creative spark. Art, Colour and Memory, Lindfield Lorna, page 24 . 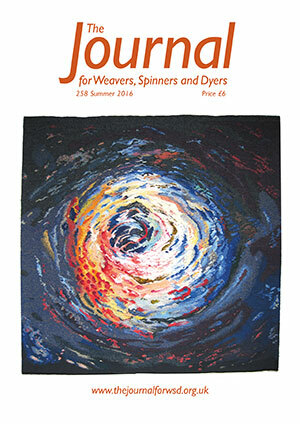 Discover why and how spinner Gemma Musson spins acrylic fibre. Rare lotus fibre is extracted from the plant’s stems: find out how it’s spun into yarn and made into cloth as you journey with Cia Bosanquet through Myanmar’s traditional textiles. Dyer Irene Taylder writes about the rainbow of colour that she and fellow mycologists create from colour-rich fungi. Sandi Toksvig talks to the Journal about her love of weaving. Learning from others can cut years off a learning curve, by gaining skills to weave a good weft-faced rug, starting a weaving class or working through a challenging commission. Experienced rug weaver Jason Collingwood shares tips for weaving a well-executed rug. Val Conway details setting up a weaving class and Martin Weatherhead explains how he faced up to recreating a nightmare Dr Who tweed! Reports, reviews and images from the Association’s 2014 Spring Conference, AGM and National Exhibition reflect the work and creativity that went into making them a success. Planning for Summer School 2015 has started, convener Chris Pegler gives us a taste of what to expect. Wendy Feldberg invites us to explore her approach to natural dyeing – printing plants directly onto fabric and paper. The exciting range of effects and colours will be irresistible to experimental natural dyers. Tara Osborough's subtle woven textiles are a celebration of the intrinsic beauty of hand-dyed yarns. Mayumi Kaneko's paper yarn lampshades are a detailed and thought-provoking study of the intriguing interaction of light and shade. As part of a sustainable initiative in northern Mongolia, Zoe Hillyard describes her voluntary work helping to teach nomadic herders to process and spin yak fibre for eventual sale as knitting yarn. At home in the UK, Kerry Lord provides a fascinating background to the production of alpaca fibre for handspinners. We report astonishing and diverse textile news in Notebook, from Janet Phillips' experiments weaving fine suture threads into delicate patches for surgery to the production of coloured threads from snail trails. Readers who responded to the Journal Design Challenge with the theme Landscape, Seascape and Skyscape created some stunning design boards. 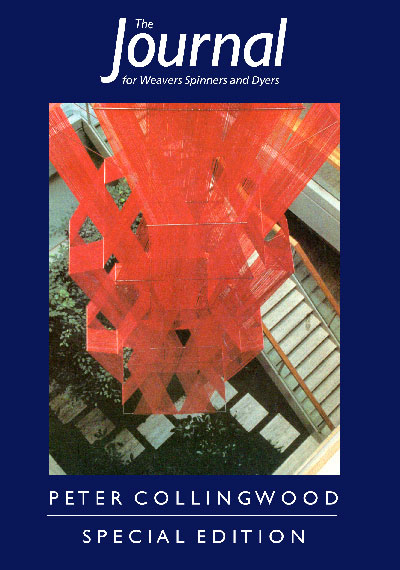 Weaving Light, Kaneko Mayumi, page 13 . We focus on the warp weighted loom : Christina Petty explores the fascinating history of this upright loom whilst Jaquie Teal revisits the techniques of its use, weaving her handspun Soay. Aviva Leigh shares her recent colourful textile-inspired trip to Japan with us, with a particular emphasis on Indigo dyeing. Much closer to home, Ian Mackintosh relates the fascinating history of the Worshipful Company of Dyers. Association events, then take a look through our suggestions for textile attractions in each area to make the most of your visit. The recipients of last year’s Association Bursary Awards describe the many benefits of attending their Summer School courses, and our usual Exhibition and Book Reviews will inspire your interests and studies. 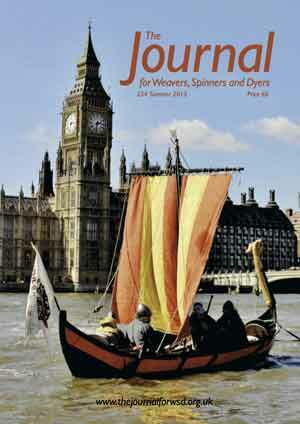 The Warp Weighted Loom: Neolithic Through Early Medieval Weaving Technology Revisited, Petty Christina, page 11 . We travel to Indonesia in two separate articles to discover stunning traditional ikats on different Indonesian islands. Much closer to home, the courses covering all aspects of our three textile crafts, and more, at the Association’s Summer School in Wales are reported by their enthusiastic participants. Time travel takes us back to eighteenth-century Spitalfields, sharing the triumphs and struggles of Huguenot silkweavers with Claude Delmas and Roberto Campana. We also look back with appreciation on the lives and work of Anne Field of New Zealand, and Paul O'Connor of the USA. Five of the candidates who were awarded the Certificate of Achievement at Summer School share their learning processes and skills development whilst Linda Wilson explains a straightforward method of extending the design possibilities from a single loom threading. The issue includes all our usual Exhibition and Book Reviews, including exciting textile innovation from the New Designers Part 1 show. We even have suggestions for unique handcrafted Christmas cards and presents. Anna Maria Garthwaite, Campana Roberto, page 28 . 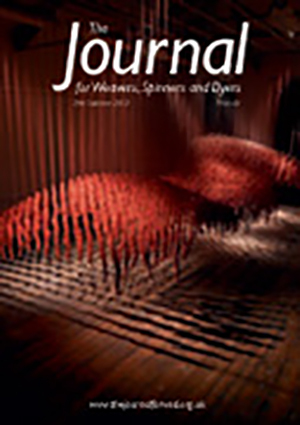 Education is a theme in several of our articles this issue - recent recipients of grants from the Theo Moorman Trust for Weavers report on their special projects or areas of study and Oxford Guild describe how the Journal’s Guild/Education Exchange Grant has helped their work with students at Oxford Brookes University. Sarah Cage’s wallhanging educates members of the public about natural dyestuffs and Ann Richards explains how differences in yarn twist can be exploited by weavers to create fascinating 3-D textures. Irem Arig shares her intense enthusiasm for designing exciting handspun yarns for the twenty first century. Bess Jamieson describes how she spun an incredibly fine yarn to recreate her grandmother’s wedding veil (1831) in stunning, delicate Shetland lace. Jane Cooper reports on the Woolsack project, which gave Olympic athletes unique, handmade gifts made from British wool. Tributes are made to the life and work of Jill Goodwin. Emerging Textures: a brief history of twist, Richards Ann, page 8 . 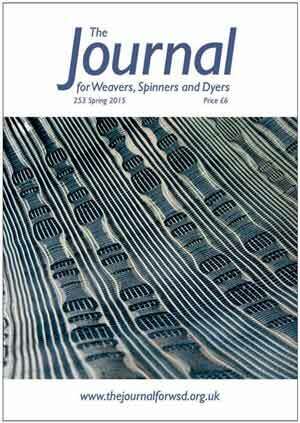 Jennifer Moore provides a detailed introduction to doubleweave on 8 shafts through a step by step sampler, and is herself introduced through an interview giving a fascinating insight into her background and inspiration behind her weaves. For spinners, Claire Crompton explains how decisions made at the yarn design stage can create the perfect garment or accessory. Unusual plant dyes yielding turquoise and green shades are explored by Krista Vajanto. On the St Kilda archipelago Margaret Tattersfield meets one of Britain’s most ancient sheep breeds, the Soay, whilst Jaquie Teal explores how their fleece could have been prepared in Neolithic times. The qualities of Worsted spun yarns are explored by Matty Smith and Lin Squires through structured sampling. Readers’ Showcase highlights just some of the projects from the Online Guild’s 10th Anniversary Challenge while we include our regular round of Exhibition and Book Reviews, Guild Highlights and Diary of forthcoming events. Doubleweave Sampler, Moore Jennifer, page 10 . We have plenty to inspire you in our first issue of 2013. Learn about how stunning purple dyes can be produced from Murex shells in Qatar (photo left, by Inge Boesken Kanold) and how intricate and equally colourful tassels can be made to complement handwoven Swedish bands. Our series on the Certificate of Achievement concludes with advice on presenting your work and an insight into the completing the Certificate in Natural Dyeing. Or learn how growing and dyeing with plants can be therapeutic. We also include detailed, practical guidance on how to sort and wash a fleece for the best results. Members of the Stratford-upon-Avon Guild describe how they showcased tapestry weaving in the stunning setting of Compton Verney, Warwickshire, while weaver Sue Christian was featured on BBC TV's 'Paul Martin's Handmade Revolution'. Our regular round up of news and reviews completes a packed Journal. Tapestry Weaving and working with the general public, Lobb Rosalind and Howells Ann, page 24 . 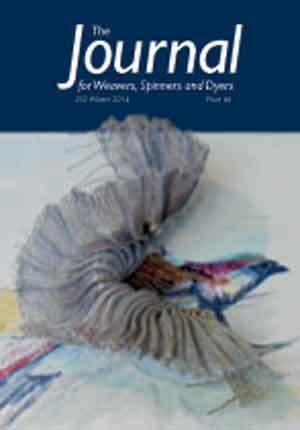 The winter Journal encourages you, subliminally, to explore new ideas and learn new skills. Wendy Morris experiments with combining metallic yarns and wires with more traditional weaving yarns whilst Deborah Gray invites spinners to select their next fleece direct from the sheep. Theo Wright describes his personal highlights from innovative students’ work at New Designers, Texprint and the Bradford Textile Society design competition. Julia Complin describes her success teaching weaving in schools whilst Anya Moore, aged 11, is already undertaking weaving and crochet commissions. Heather Seddon and Mary Hildyard provide an insight on the challenge of the Certificate of Achievement in Weaving and Tapestry Weaving. Reports from the Association’s National Exhibition, Guild Highlights, Book Reviews and Exhibition Reviews, plus our new Showcase feature, round off a packed issue sure to distract you from the winter blues! 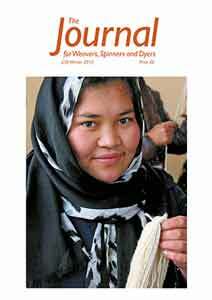 Weaving in Schools, Complin Julia, page 26 . This issue contrasts traditional and contemporary. 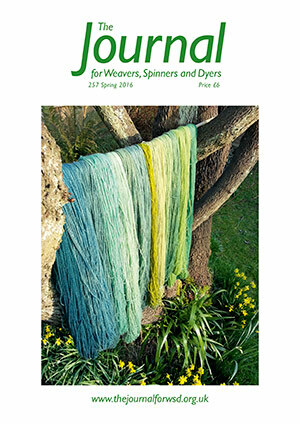 Valerie Bryant leads us on a countrywide trail to discover historic spindle and cottage spinning wheels in National Trust properties while Christina Chisholm goes back to first principles of weave design. 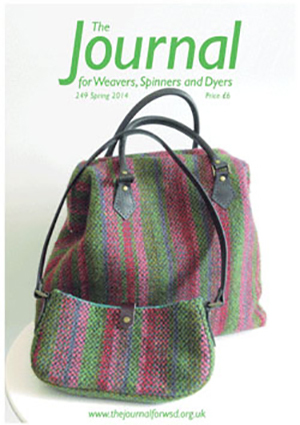 She has home-produced traditional Chisholm tartan cloth using handspun and hand-dyed yarns. Kennet Valley Guild members focus on natural dyeing, preparing wool yarns to weave a series of cushions. Ann Hecht takes us to the plains of Patagonia to research the long history of the guanaco, and some of the world's finest fibres. 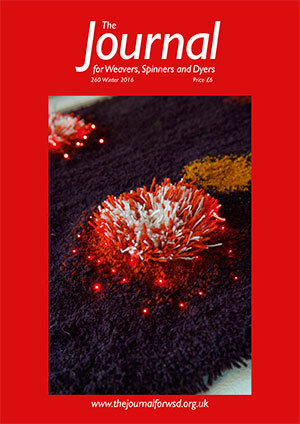 Sue MacNiven provides essential advice and inspiration on how to blend and spin exotic fibres. In a highly contemporary vein, Belinda Rose's innovative three dimensional pieces illustrate how she weaves paper yarns, and Sarah Tucker reveals how Procion dyes and batik techniques can produce evocative 'painted' landscapes. News of exhibitions, Guild activities past and future, book reviews and courses round off another packed and informative publication. Handspun, Hand-dyed and Handwoven Chisholm Tartan, Chisholm Christina, page 7 . In this issue we celebrate ‘the blues’ with a strong indigo theme. Jane Deane introduces Michel Garcia’s simple fructose vat, Jenny Balfour-Paul describes a multi-disciplinary educational programme, Christina Chisholm and Isabella Whitworth share their tips for growing and using Japanese indigo and we review Mary Lance’s film Blue Alchemy. Klara Decker explains how to blend fibres efficiently using a drum carder and we take a step-by-step view of dyeing and weaving ikat with Kaz Madigan. If you have ever wondered how the Vikings kept themselves warm and dry, you will find the answer in Satu Hovi’s article about weaving her own Viking rain cape. Reports from the 2011 Summer School and Certificate of Achievement bring us up-to-date with Association events. We also hear from the recipients of the 2010 Theo Moorman Trust awards about how the grant has supported their work. Certificate of Achievement 2011, , page 34 . In this issue Sue Hiley Harris tells the story of her Ancestor Bags, their meaning and their creation. 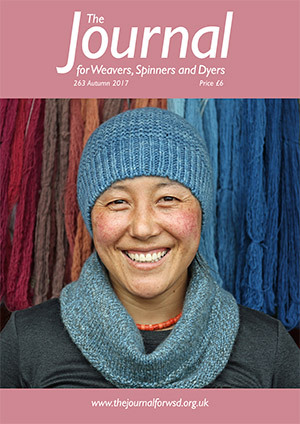 The final snapshot from Diane Gaffney’s “Meetings with Remarkable Dyers” takes us to an indigo plantation in Java, while in the downloadable article Stephanie Bunn introduces us to the fascinating woven textiles of Kyrgyzstan. 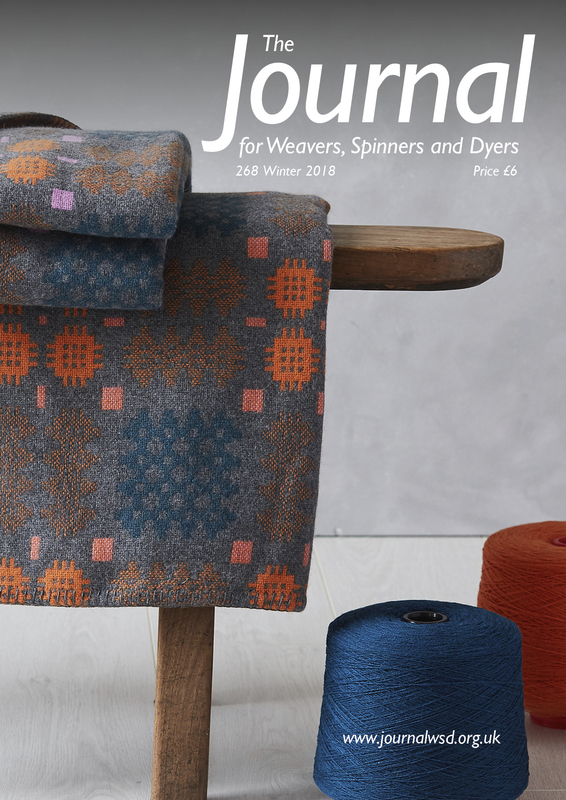 There is practical advice from Amanda Hannaford, who compares Scotch tension with double-drive spinning wheels, and from Stacey Harvey-Brown, who describes what to look for in a secondhand loom. Lesley Prior invites Guilds to get involved with the Campaign for Wool, a profile of recent graduate Holly Bradley-Gill takes us on a tour of international trade fairs, and Diane Sergeant opens the door to Gainsborough Silk Mill. We offer you another glimpse behind the scenes of Journal production and show how you might get involved. Bare Bones of The Bags, Hiley Harris Sue, page 16 . 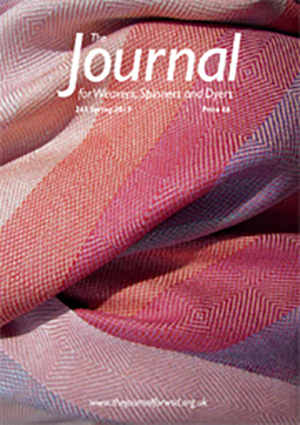 In this issue there are two articles on devoré; one by Dr Andie Robertson on her historical studies and another by Anne Field describing the process of weaving and decorating a scarf using the devoré technique. Ann Hecht takes us on a fascinating journey into the past to explore why silk production did not survive on a commercial scale in the UK. Jane Deane describes how to rear silkworms today. Jenny Dean and Krista Vajanto write about using natural dyes and mordants. Tapestry weaver Joan Baxter shares her approach to concept and design for her tapestry inspired by Sorley MacLean's meditative Gaelic poem 'Hallaig'. Peter Fisher gives a glimpse of the processes, machinery and history of Coldharbour Mill in Devon - a working woollen mill open to the public. Concise History of the Devor_ Textile, Robertson Andie Dr, page 15 . Jason Collingwood’s memories of his father, and an interview with Peter Collingwood on ply-split braiding. Unpublished writing by Peter Collingwood on Burmese Manuscript Bands with an introduction by Ralph Isaac. Chronology, Peter Collingwood, page 52 .